And why the Top Chef alum won’t make the same mistakes twice. 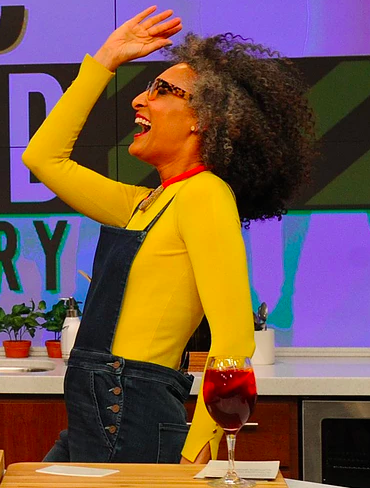 Runway model turned caterer turned TV star Carla Hall has become a household name, thanks to a stint on season five of Top Chef and her work on The Chew, the Emmy Award-winning culinary variety show on ABC she hosts alongside Mario Batali, Michael Symon, and Clinton Kelly. But as Hall found out the hard way, fame doesn’t necessarily lead to success in the restaurant business. “Everyone assumed that my first restaurant's success was a foregone conclusion,” Hall said recently on stage at Nation’s Restaurant’s News MUFSO conference. But that wasn’t the case: In May 2016, she opened the fast-casual Carla Hall’s Southern Kitchen in Brooklyn to great fanfare — and the restaurant closed for good last August. “It took us two and a half years until we opened our doors, and then we were only open for a year,” she said with a tinge of sadness in her voice. Despite her fame and fortune, despite the 20,000 cookbooks she’s sold, despite the 12 million people that watch The Chew each week, Carla Hall’s Southern Kitchen was a failure. During her keynote address at MUFSO, Hall gave a post-mortem on her restaurant, examining the reasons why it shuttered — and the lessons she’s learned along the way. She also promised that she’ll be back with another restaurant concept before long. 1. Fame doesn’t guarantee success: “In fact, my previous success made it harder in some cases,” Hall told the audience at MUFSO. Though she’s a daytime TV host who’s broadcast into millions of homes across the country five days a week on The Chew, that didn’t translate into free publicity for Carla’s Southern Kitchen. As she explains, “There are limitations to being on The Chew in self-promoting.” Hall couldn’t plug her restaurant every time she was on TV, nor could she constantly promote it on social media under the terms of her ABC contract. Hall’s fame also meant the restaurant was able to raise more than $250,000 from fans via Kickstarter, but she later came to regret taking the crowdfunding route, saying, “How we funded the restaurant is really what ultimately led to our downfall.” Some fans were outraged by the idea of a celebrity soliciting donations from fans to open a restaurant. “It's an understatement to tell you that I got beat up by the social media community for using Kickstarter,” Hall said. She also acknowledges that they launched the fundraising campaign much too early — nearly two years before the restaurant actually opened — which left backers wondering what was being done with their money: “So, we had all these people basically asking us, ‘What's up? Are you stealing our money?’ ... The people don't know that it takes time [to open a restaurant]. They don't know how much things cost.” Then there was also the issue of fulfilling all the Kickstarter rewards: People who donated as little as $10 were promised a boatload of swag, from cookie mix to free meals once the restaurant opened. 3. There’s no such thing as enough time: Between filming The Chew and other commitments including book signings, cooking demos, and nonprofit events, and commuting back and forth between NYC and her home in D.C., Hall admits she didn’t spend as much time in the restaurant as she would have liked. 4. Branding isn’t everything: “Because of my notoriety there was a tremendous amount of focus put on the restaurant's branding from day one,” Hall said. The restaurant team spent too much time and money worrying about branding the restaurant for future expansion into a chain, rather than focusing on making the first restaurant a success. In addition to taking up time, a lot of capital was spent on branding efforts that could have been used elsewhere. “Those resources put into soft costs might have been better spent if they were put directly into the restaurant itself with a focus on talent, people, and training,” Hall said. 6. Experience counts: Hall is a talented chef who proved she had serious cooking chops on Top Chef and ran a successful catering business — but culinary know-how doesn’t mean she knew how to operate a restaurant.